What I really wanted to call this post was ‘There’s A Guy Work Down The Chip Shop Swears He’s Elvis‘ but it wouldn’t fit, so I’ve stuck to the usual format. ‘There’s A Guy’ is a wonderful song title from 80’s British songstress Kirsty MacColl who also covered ditties by Billy Bragg and sang with the Pogues. Why am I referencing that song? Well, to draw a long bow, one of the owners of Gardel’s Bar is Elvis Abrahanowicz who is partner in the Porteño* takeover of Sydney. When else am I going to get to mention a song title and expose you to the lesser known side of 80’s Brit Pop? I’m off to South America this week so I wanted to get ‘in the mood’. Whilst Porteño is still on the list, perhaps half a grilled cow is a little too much even for me on a Monday night so I worked up an appetite walking from the Sydney CBD to the fartherest edge of Surry Hills to visit Porteño’s upstairs, Gardel’s** Bar. I was very impressed to have the door opened with a flourish by the official welcomer who ushered me up a narrow flight of stairs to the Bar. It may have been a Monday night but the joint was jumping. My waitress offered me a seat at the bar but retracted when she saw the crush and took me straight to the small dining area where I had a choice of tables in a dimly lit salon, filled with the beautful people. It was a warm night and so the first order was a refreshing Gancia*** y Pomelo cocktail. Armomatised Wine & House Pink Grapefruit Soda, I expected it to be red wine but it was in fact white, making the cocktail a pleasing pink colour with a slight spritz on the tongue. 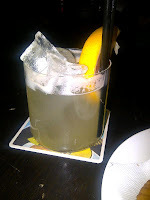 This is said to be a national drink and though I had never heard of it, it went down very well. So well in fact that I decided to eschew the Argentinian reds for the evening and partake in a second Gancia. I was interested in trying the Mixed Pickles ($6) with my cocktail but they were unavailable which was slightly disappointing (how do you run out of this menu staple?) but quickly forgotten with the arrival of my Pumpkin & Fetta Empanada w Garlic Yoghurt Sauce ($6.50). The empanada was a decent size and full of sweet pumpkin. I couldn’t discern the fetta but that was neither here not there as the crisp homemade, buttery pastry made it a delight to eat. The garlic sauce was very garlicky indeed but I couldn’t stop dipping pieces on the empanada in, so it was just a well I was heading back to my empty hotel room and not the arms of a Latin lover. By the time my second drink arrived, the place was full but it didn’t stop my Fennel Meatballs w Pecorino ($10) arriving in quick smart time. Three largish meatballs in a homemade tomato sauce, I enjoyed them but they were not my favourite dish of the night. There was nothing wrong with the meatballs but I found the Pork texture too smooth and compressed for my tastes. I like something a little more open and rustic in texture but I wouldn’t dissuade you from sampling them yourself. A slice of bread would have been a nice accompaniment to mop up the sauce. The final choice from the 15 or so items on the bar menu was the Chilli Dog ($4.50). I was tempted by the Grilled Octopus w Chorizo, Potatoes & Sofrito ($14) but was concerned it may be too much. The Chilli Dog was the ultimate Dude Food/Comfort Food cross over. A homemade bread roll (half the size again of dinner roll), it contained a small grilled chorizo topped with the tastiest beef chilli I have had since my mum was whipping up batches in the 1980’s. A generous crown of crispy fried onions that melted in the mouth, topped the Dog. Simple and satisfying. It’s lucky I don’t live in the suburb as I could see myself dropping into the bar to have one of these every day to stave off the hunger pangs on the walk home from the bus stop. I was right to go with the smaller Chilli Dog option which was more than enough for this solo diner. I’d had more than enough so it really pained me to say no to the Licorice Gelato w Pineapple Sorbet ($8) but hopefully I can try this again another time. In Melbourne, Andrew McConnell’s establishments are my ‘go to’ for service, quality and quirky menu ideas. I can see that Elvis & Ben Milgate are becoming my ‘go to’ in Sydney. A clever and enticing bar menu with very reasonable pricing aimed at a casual dining that’s a step above a lot of the shared plate menus around at present. I just squeaked it in when I visited as I noted whilst writing up this post that from September (so, next week), Gardel’s and Porteño won’t be open on Monday evenings anymore. Whilst both places were at capacity on the Monday night I visited, it must not always be so. There is a trend being led by Sydney but creeping out to all the capitals where many of the quality bars and restaurants are no longer open on Sunday, Monday & Tuesday evenings. Some don’t even do Wednesdays. It’s a chilli dog eat dog world out there and restaurants are finding it tough to compete and keep their heads above water. By compressing the demand, the seats stay filled and the restaurant is more likely to thrive. It makes it tough for this solo diner, who often finds herself in capital cities on a Monday night, with a long list of restaurants to visit that remain unfulfilled. It just means I have to look that much harder – I’m not giving up! *Porteño – the people from the port city of Buenos Aires. They’re a bit sniffy & consider themselves above other Argentinians. The beautiful people. **Gardel – Gardel’s namesake was Carlos Gardel, a singer songwriter who is inextricably linked to the rise of Tango. He died at the peak of his career in a plane crash in 1935 and is still revered throughout Latin America. His face graces the coasters and matchbooks (!) dotted throughout the bar. ***Gancia – an Italian wine making company that makes the wildly popular spirit based Gancia Aperitivo Originale with flavours of citrus and spice. It’s made in bootleg batches to favourite family recipes all through Latin America.